Employers are facing a major skills gap. It’s a problem that exists around the world. As more students pursue four-year degrees, the numbers of those entering the technical trades has started to dwindle. These trades include jobs such as plumbers, electricians, carpenters, and even cosmetologists. While these careers may not represent those students traditionally consider, they offer plenty of opportunities to earn an honest income. They’re also in high-demand. 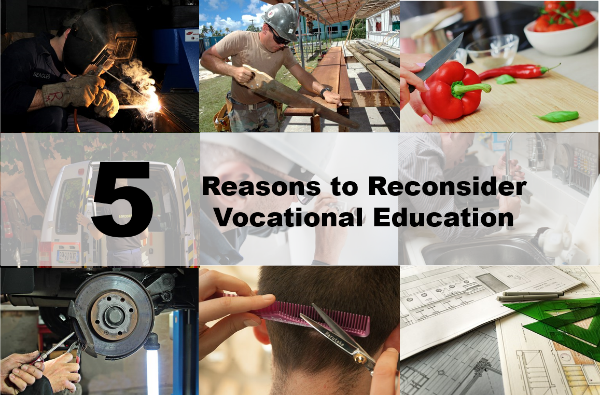 As state and local education departments begin to devote more time and money to creating new career and technical education centers, it’s time for everyone else to take a second look at vocational education. Did you know that demand for cosmetologists is expected to rise by 20% between 2008 and 2018? The same is true for plumbing, which is expected to grow by 22% by 2022, and for electricians. Even as the world becomes more complex and focused on technology, people still need those skilled in the trades to complete a variety of tasks. The increasing cost of college has many students looking for less expensive options. Often, obtaining vocational training costs much less and takes less time than a traditional four-year degree. While the average starting salary for a graduate of a trade school may be less than a graduate with a four-year degree, when you add in the difference in cost and the potential for future earnings, taking the trade school route may seem more appealing. Many who go into vocational trades do not remain in lower-level positions for the duration of their career. In fact, once they get some experience under their belts, many start their own businesses and begin to hire and manage employees of their own. Those who opt not to go out on their own can still advance to supervisory and management positions within their companies. If they are laid off from a company, it’s often much easier to find another job than with less technical career paths. Even if students do not pursue a career in a technical field, just having technical skills can benefit them in life. Think about the amount of money you spend to fix a plumbing problem. Now imagine how much you’d save if you could fix that problem yourself. Those who know a technical trade can save themselves and their family members a lot of money by doing high-priced repairs themselves. A carpenter can save a lot of money by doing remodeling work. A cosmetologist can save money by doing family members’ hair. Some students even use the technical skills they’ve learned in high school to help them pay for a four-year degree in another area. For example, a student with culinary arts skills can work as a cook or even run a culinary business while going to school. A student with carpentry skills can work construction jobs in the summer to help pay for school in the fall. Even if students opt to pursue a degree in another field, having technical skills can help them when they enter the workforce. For example, in STEM fields, understanding the principals of electricity or drafting can help students develop stronger technologies. Knowing how to read and take apart technical texts can also be beneficial when it comes to reading business manuals and understanding complex systems in the workplace. Watch for more subject areas, such as auto body and welding, coming soon as our vocational education offerings expand. Do you teach vocational education or have you seen the benefits of technical training firsthand? If so, we’d love to hear about your experiences. Your points are on the mark. I teach STEM and see that 40-50% of would benefit from greater awareness of STEM-Vocational career tracks. We need more help from parents. Excellent article. I shared with colleagues. Career and Technical Education is so relevant and necessary for today’s youth. Not only does it provide students with training in a variety of hard skills, it is allowing students to realize the benefit of the soft skills employers require. With the growth in these jobs I hope that more parents will see the benefits of Career and Technical Education for their children. most of my students do not know what the job they like. they usually ask me which job can earn more money? How can we help students realize their own passion?